Good Morning, this is Capital Essence’s Market Outlook (the technical analysis of financial markets) for Thursday August 30, 2018. Stocks closed higher Wednesday as traders cheers the resumption of U.S.-Canada trade talks. For the day, the Dow Jones Industrial Average rose 0.23 percent to close at 26,124.57. The Nasdaq gained 1 percent to close at 8,109.69. The S&P added 0.6 percent to 2,914.04. The CBOE Volatility Index (VIX), widely considered the best gauge of fear in the market, fell 2 3 percent to close at 12.25. Tech stocks attracted strong buying support Wednesday with Amazon and Alphabet leading the gains after Morgan Stanley raised their price target on these stocks. The Technology Select Sector SPDR ETF (XLK) closed at record high, up 0.91 percent to 75.77, bringing its YTD gains up to more than 18 percent while the S&P gained about 9 percent over the same period. Now the question is whether the rally has more legs? Below is an update look at a trade in XLK. Our “U.S. Market Trading Map” painted XLK bars in green (buy) – see area ‘A’ in the chart. The first dominant feature on the chart is the rising trend starting in early 2016. The second dominant feature of the chart is the early 2018 congestion period. The February and April downswings tested and held support at the 20-week moving average, a key technical level. The late June rally pushed the ETF above the early 2018 high, signify a bullish breakout. 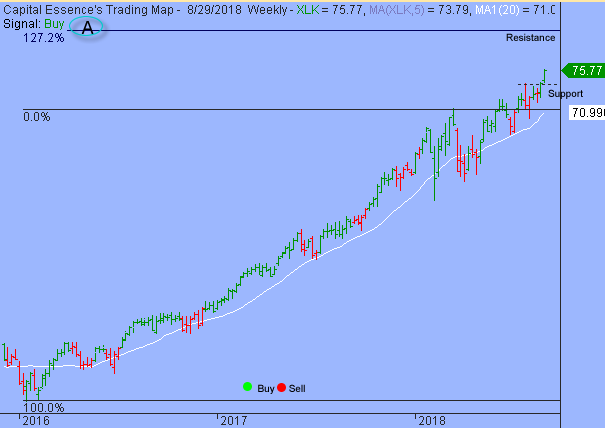 Over the past few weeks, XLK has been basing sideways using the early 2018 high as support. This is a bullish development, indicating a positive net demand. This week’s rally pushed the ETF above the late July high, signify resumption of the multi-year major upswing with upside target near 80, based on the 127.2% Fibonacci extension. XLK has a strong band of support between 74 and 71. Short-term traders could use that level as the logical level to measure risk against. Short-term technical outlook remains bullish. Last changed August 21, 2018 from neutral (see area ‘A’ in the chart). The S&P trades in broad trading bands that define the trend behavior. The upswing was very rapid with some short-term consolidation near each of the significant support or resistance levels. These support and resistance levels also define the limits and barriers to any future rally and uptrend development. S&P continues drifting higher near the lower boundary of the red. 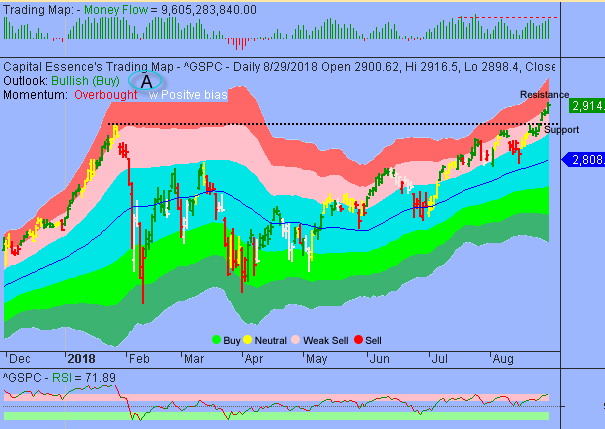 Money Flow measure flashes a weak bull signal as it trended higher from above the zero but still unable to take out the July peak, indicating less money’s chasing stocks higher. Adding to concerns is the overbought conditions. While overbought condition is normal during a pro-long uptrend, it’s suggested that upside momentum might not sustain without at least a short-term breather. These elements might negatively affect trading sentiment over the coming days. With this in mind we’d consider reducing exposure into overbought strength. Short-term trading range: 2900 to 2920. S&P has support near 2900. A close below that level has measured move to 2860, based on the lower boundary of the pink band. The index has resistance near 2920, based on lower boundary of the red band. Above it a more significant resistance lies at the upper boundary of the red band, around 2966. Long-term trading range: 2800 to 3000. S&P has support near 2800. A close below that level will trigger a major sell signal with a downside target near 2700. The index has resistance near 3000. In summary, overbought conditions have returned on a daily basis but momentum remains supportive so downside risk could be limited. It is possible that S&P could continue to drift higher as trading sentiment remains strong. As for strategy, traders should look to reducing exposure into overbought strength or at least buying downside protection for winning positions.